In this post, Mordy Oberstein from Baltimore speaks eloquently of the spiritual trumping other concerns regarding the decision to make aliyah. In my opinion, living your life so that, as often as possible, the spiritual trumps everything else, is a huge benefit of life in Israel. I want to share some thoughts and feelings that I recently had about the experience of making Aliyah, more specifically, the process of making Aliyah. My family is moving to the land next summer and we are in the midst of preparing to begin the next step of our lives, no easy task. Ever since I returned from my pilot trip in July our attention has been on navigating the process of entering the job market in our current professions. My wife is a nurse and I am a teacher. Both us need to transfer our licenses over to Israel. The process of transferring our licenses and having our degrees recognized is to put it mildly, extremely complicated. For instance, even though I have a Master’s degree from a prestigious university, my Bachelor’s is quite problematic, due to the yeshiva credits the college transferred in. The Ministry of Education may not even recognize the degree due to the credits, which subsequently means they will not recognize my masters either which would result in a pitiful teacher's salary that for all practical purposes would mean I could not be a teacher in Israel. Needless to say I have been hounding every person possible to determine if this is indeed a problem for me. After weeks of contacting scores of people I have found an answer, namely that there is none, it all depends on who is sitting behind the counter at the ministry when I show up with the documents and degrees. The result of this conclusion is a state of flux, I have no concrete reality in which to base any security on. You could only imagine the stress, here I am, moving to a country 5,600 miles away where I can hardly get by with the language, trying to make it and support a wife and two kids. But to be honest the biggest fear I have is being forced to return to America, to leave G-d, and abandon him, and be forced to come back to a land where I am a "resident-stranger." Oddly enough I have found my orientation, my bearings, I am feel no hesitation in surging forward to my new home. In order to share with you how I got to this point, and why it is so significant I think for anyone who is making Aliyah or already has, I want to relate another "conundrum" I am currently facing, as I think it is not of coincidental nature. As I mentioned I am a teacher, I teach in the inner city of Baltimore to a very difficult population, in a very difficult educational environment. The educational environment of America today, in my humble opinion, is extremely neurotic and unhealthy. Schools, principals, and even teachers are hyper-focused on test scores and academics, leaving the more intrinsic, internal, and subsequently spiritual needs of students to fall to the wayside. Most teachers battle the conflict of how to reach the students, do what is right for them, and obtain a satisfactory evaluation at the same time. I can't really explain why necessarily, but this year I feel a deep calling to do what's right not for myself, not even for the students, but for G-d. I feel a profound need to help the students become more solid people for the sake of G-d, so that He may have his children redeemed and returned to him. As such, walking into this school year I don't care about my evaluation, I don't care if I get a good reference letter for Israel, I care to not let G-d down and to ensure I meet His/my destiny. Funny how this is, the feeling of forsaking my own welfare for G-d's, because this is how I view moving to Israel. How can I move to a place where I don't feel any sense of financial security? Where my job possibly is topsy-turvy and where I can get no solid grasp of the situation on the ground? It is because I am not moving for myself. I am not moving to have some sort of transcendent religious experience or awakening, I am moving because I already have one. I am moving for G-d. I am moving because G-d calls out from behind the broken walls of Yerushalayim beckoning me not to leave him alone in the ruins, to pull him out of the ashes of our history and to re-build, to "make his name rest there" as we just read in the Parsha. What happens to me, what becomes of me is not significant per se, it is only significant in so far as it affects my ability/inability to fulfill the want of G-d. This is what allows me the ability to overcome my fears and to leap into the unknown stormy waters of the sea, neck deep in the tides, as our great ancestor Nachshon did upon hearing the Egyptian army at his back. I am not concerned or afraid for myself, because I am afraid for G-d.
As Rabbi Soloveitchik points out in "Al Hateshuva", when one makes his fear the fear of G-d all other fears fall away, when makes his allegiance to G-d all other allegiances become secondary. As a result I walk away with a feeling (most of the time) that I will be successful, I feel this way because I feel that unlike Kayin, my offering is pure and G-d will not reject it, he will allow my gift to be received and will allow me to continue to give to Him so long as I leap with faith and everlasting commitment, so long as even the waters at my neck do not discourage me, he will draw me near to satisfy Him. Do not get me wrong, I suffer from tremendous bouts with extreme doubt, but let me conclude with a recent event that occurred. I was having Friday night Shabbat dinner with someone and was telling them of my plans to shirk off the normal worries of a city schoolteacher. I told him that I was a Jew first and a teacher second, that I had a duty to fulfill as Jew in the world in a position of influences over children that trumped my role as an academic instructor even at risk to my personal well-being in the pragmatic sense. I was taken off guard by the response. He replied back to me, what does being a Jew have to do with your role as a teacher, why would you put yourself at risk, you may need the school administration for reference once you get to Israel?! I couldn't help but to have doubt on my position, which perhaps I was being too idealistic, too removed from the reality before my eyes and too involved in the majestic and transcendent, perhaps my whole outlook was simply an illusion?! I want to tell you what I concluded. I have concluded that it would be a sin (not in any dogmatic way, but as something that would keep me further away from G-d's call). This urge, this calling to give to G-d for the sake of G-d is no weak phenomenon. It is a powerful calling from the depths of my being. There are times when we are unsure about a decision we need to make, and this uncertainty often stems from our natural inability to see things with perfect clarity. 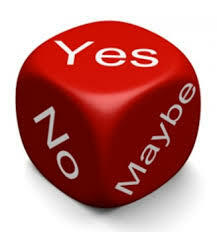 In such cases doubt, hesitation, and even the changing of mind is certainly warranted. However, there are times when something is speaking to us from within us, and this speaking is so powerful and real that if we were to ignore it we would be violating the greatest sin of all, insensitivity, deafness, to G-d's word and calling. Sometimes something is so powerful so forceful (in an autonomous manner) that it would be a tragic mistake, a sin even to ignore it. What determines whether or not we should follow a certain notion is not only the logical validity of such a choice or decision, but sometimes the very thought and feeling determine its validity. Again, in Al Hateshuva Rabbi Soloveitchik discusses the idea of the Gemara in Chagiga (16a) that says "He who is not aware of the glory of his creator - it would have been better that he had not come into the world.” Rabbi Soloveitchik mentions the Gemara considers this to be a person who sees a rainbow for example and does not see the glory of G-d within it, but merely views it in a mechanic and scientific manner. That is to say, then when something screams at you the glory of G-d, you have no right to ignore. Similarly when G-d's mighty call screams from the depths of one's own being we have no right to ignore it, no matter the consequence that may face us. The Jew must live a life of considerations that are "other-worldly," this is what it means to be a Jew, and to me, this is what it means to journey to Israel. In the circles of olim from America in which I travel, it is very common to talk about all the Jews who are left behind in America. Most of the conversations consist of scratching our collective heads and incessantly asking one another, "Why aren't they coming?" We are stymied, and sometimes, to be honest, holier-than-thou. We saw the light. We sacrificed. We picked up our lives and moved to Israel. We saw the direction of Jewish history. 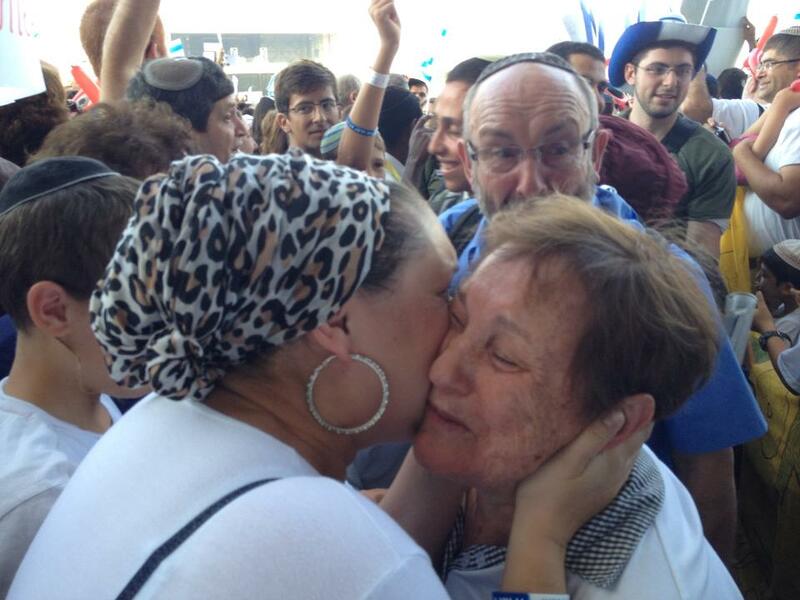 We watch in horror as the light of the Jewish people outside of Israel dims. We think we know what's coming and it will not be pretty. And we can't understand why they can't see what we see. Rabbi Nachman Kahana explains that the reason why aliyah (as in, getting called to the Torah) and aliyah (as in, moving to Israel) are the same word is because Hashem calls each of us to make aliyah one at a time, by name, exactly as an individual is called to the Torah. Many of us who are here share the common experience of "getting the call". Many of us are aware that we were called to move to Israel. Whether we say we caught the aliyah bug, we had our aliyah switch turned on, or whatever language we use, many of us can describe the decision to make aliyah as having been, if you will, Divinely inspired. With somewhere between 3 and 5 million Jews left in America, why are only 3,000 or so coming each year? It's absolutely true that there are those who would like to come, some very desperately, but they have compelling circumstances that force them to stay in America for now - elderly parents, family connections they are unwilling to break, health concerns, child custody issues, an unwilling spouse, etc. The vast majority, however, never give living in Israel a thought. It sounds haughty of us, but we commonly assume that American Jews, especially religious American Jews who "ought to know better" are too consumed with their materialistic lives - unwilling to give up their big house, their government job, their comfortable lifestyle, their positions of communal influence - to follow Gd's command and live here in the Palace of the King. 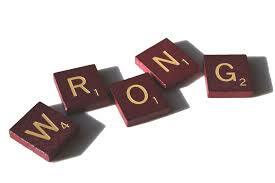 But what if we're wrong? What if Hashem, for His own reasons, doesn't actually want all the Jews to come to Israel just yet? Rabbi Pinchas Winston teaches that everything that occurred to the Jewish people during the Exodus from Egypt will recur in our days as we approach the Final Redemption. So let's consider some things that happened then which just might be recurring today. In Egypt, Pharaoh was unable to see what was really going on right in front of his eyes. We say that Hashem hardened Pharaoh's heart, preventing him from having a clear vision and making a different choice. Is it possible that the American Jews who have not yet "received the call" are subject to the same Divinely-inspired blindness? I'm suggesting that maybe it's not their fault. Maybe Hashem is preventing them from seeing the bigger picture. Just as He hardened Pharaoh's heart. The Israelite slaves had the lowest standing in Egyptian society. Redeeming a group with power and influence, such as the elevated status the family of Yosef enjoyed in Egypt while Yosef was still alive, is not as big a miracle as redeeming the group with the least amount of prestige. Maybe Hashem's plan is to leave the majority of Jews in America and have their economic and social status decline to such an extent that when He decides to redeem them, it will be an even greater miracle because He chose to redeem a degraded people. Just like He did in Egypt. Finally, the Israelite slaves did not leave Egypt one at a time, or even 3,000 a year. They left together in one huge, miraculous exodus. Maybe Hashem is keeping the majority of Jews in America specifically in order to redeem them en masse. Just like He did in Egypt. I'm not suggesting that I know for sure that this is the case. It is, in the words of Jonathan Swift, a modest proposal, a kinder, gentler way to think about the Jews who remain in America without any intention of making aliyah. 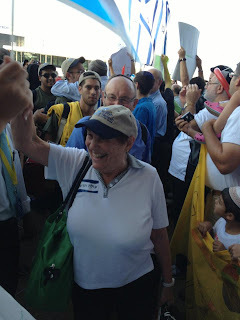 While it's extraordinarily gratifying to welcome olim who are even newer than ourselves, especially when they are cherished friends and family from The Old Country, it's a fact that the number of American Jews who make aliyah each year are a tiny minority relative to the number of Jews who are not coming. Whether you are already privileged to live in Israel or whether you are firmly rooted in America, I want to hear what you think. Does the possibility I have outlined here, that Hashem doesn't want all the Jews to come to Israel just yet, strike you as plausible? ITEM: Yesterday, I was reading a newsletter from an organization whose work I admire very much. The newsletter included this video, a 4-minute long collage of images from the Bnei Anousim community in El Salvador, highlighting a series of the community's recent events. Watch it and tell me if you notice what I noticed. Are there no women in the Bnei Anousim community in El Salvador? If there are, you'd never know it from watching this video. Note: A few readers have pointed out that,on three occasions, women or girls are on the screen momentarily .That doesn't change my point. The images are of men in the community engaged in Jewish activities. 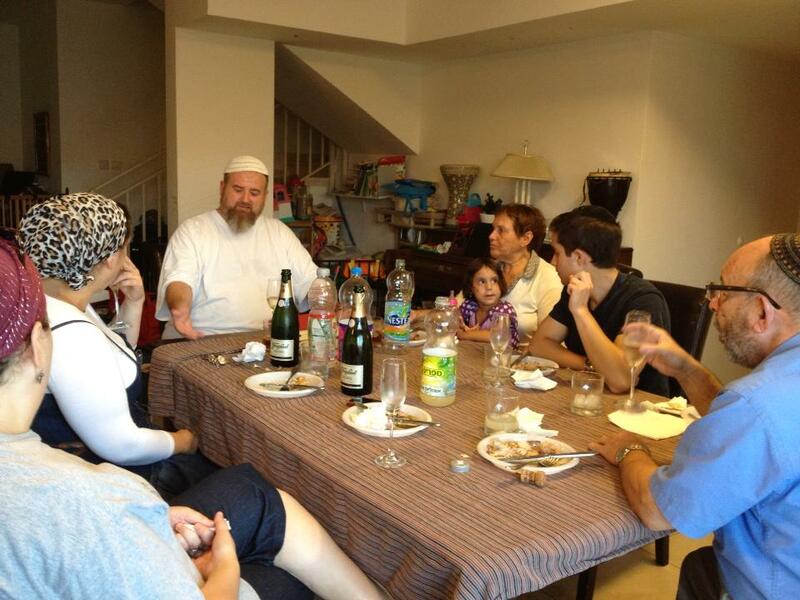 As such, the video represents a skewed perspective on Jewish communal life. ITEM: Today, I got an email inviting me to attend two workshops for women in business that are being offered by a different organization. The first is being given by a Mrs. Milworm. The second by Rav Dovid Kaplan shlita. He gets a first name, two honorifics and his name in large letters. ITEM: A prominent Jewish magazine recently published a 4-page article about a colleague, describing how she became religious, moved to Israel and opened a business making wedding dresses and establishing a wedding dress gemach. Hoping the PR from the article would generate business for her, my colleague was disappointed to learn that neither her name nor the name of her business appear anywhere in the story. When she inquired, she was told, "We assumed you'd want to be anonymous." ITEM: On page 49 in the Koren Yom Kippur machzor, there's a note that says: "Yom Kippur is the only time we wear a tallit at night..." This tendency to use language that assumes all Jews are male is so pervasive, I could write an entire tractate on just this one point. I could bring dozens more examples, because they happen nearly every day. To some, I know I sound like a nattering nabob of negativism. Nevertheless, I point this out because, when Jewish women are overlooked, dissed or completely absent from the picture, it wounds me physically. Intellectually, I know that these, ahem... oversights, are the residue of the curses that were pronounced upon Chava, and therefore upon all women until the geula, for the ancient sin in Gan Eden. I profoundly believe that the whole world is in the process of healing from the diminishment of women's spiritual power and that these issues will eventually resolve. As my teacher Devorah (Heshelis) Fastag wrote in her book The Moon's Lost Light, the prophecy of nekevah tisovev gever (Yirmiyahu 31:21) assures us that eventually, women will, once again, be valued equally with men. Not by Gd, because certainly in Gd's world, that is already the case. But it is not yet the case in the human sphere. Eventually, all this nonsense will evaporate like so much inconsequential fluff. When an aliyah dream that has been nurtured for more than 50 years finally comes true, it calls for a celebration unlike any other. 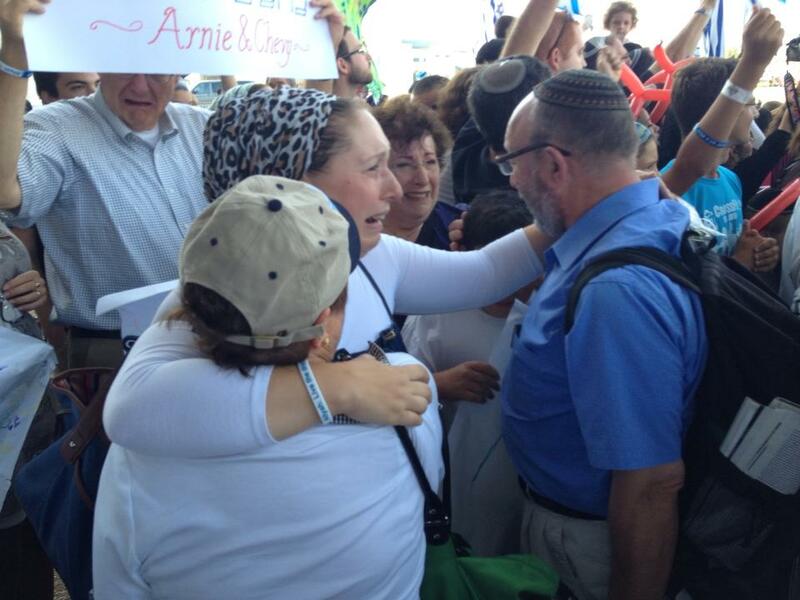 Rabbi Aharon and Batsheva Fine made aliyah from Canada yesterday, fulfilling a life-long dream. They were lovingly greeted by their daughter Shira, along with her family and friends. The emotion in these pictures speaks for itself. 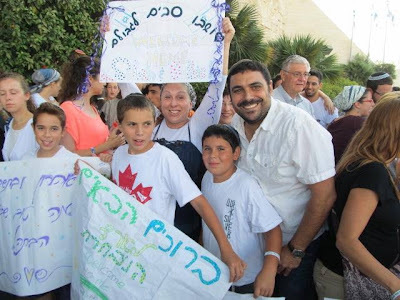 Yoel Keren, a friend who has grown particularly close to the Fines during their visits to their daughter and her family over the past five years, wanted to honor the Fines' aliyah in a special way. Inspired by the thought that, if Hashem requests that we celebrate the exodus from Egypt each year at Pesach time, surely He will delight in our celebration of the final exodus from the lands of our dispersal to the Land of Israel, Yoel invented The Aliyah Seder. 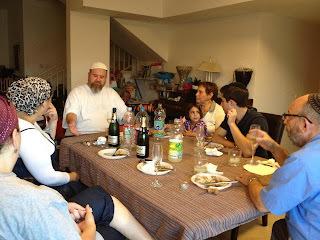 Yoel (in white) leading The Aliyah Seder. The Aliyah Seder was drafted on something of a whim, but the emotional reaction around the table was so compelling, Yoel knew he was on to something. I have the honor of sharing the Hagaddah of The Aliyah Seder in the hope that the practice spreads. If you are already privileged to live here, you can use it to create a meaningful, private welcome for family and friends as they return Home. The Aliyah Seder Hagaddah can also be used by synagogues and communities to welcome the new olim among them. And it is equally appropriate to mark the annual anniversary of one's own aliyah. יד לָכֵן הִנֵּה-יָמִים בָּאִים, נְאֻם-יְהוָה; וְלֹא-יֵאָמֵר עוֹד חַי-יְהוָה, אֲשֶׁר הֶעֱלָה אֶת-בְּנֵי יִשְׂרָאֵל מֵאֶרֶץ מִצְרָיִם. טו כִּי אִם-חַי-יְהוָה, אֲשֶׁר הֶעֱלָה אֶת-בְּנֵי יִשְׂרָאֵל מֵאֶרֶץ צָפוֹן, וּמִכֹּל הָאֲרָצוֹת, אֲשֶׁר הִדִּיחָם שָׁמָּה; וַהֲשִׁבֹתִים, עַל-אַדְמָתָם, אֲשֶׁר נָתַתִּי, לַאֲבוֹתָם. 15 but: 'As the L-rd liveth, that brought up the children of Israel from the land of the north, and from all the countries whither He had driven them'; and I will bring them back into their land that I gave unto their fathers. בָּרוּךְ אַתָּה יי אֱלֹהֵינוּ מֶלֶךְ הָעוֹלָם, בּוֹרֵא פְּרִי הַגֶּפֶן. בָּרוּךְ אַתָּה יי אֱלֹהֵינוּ מֶלֶךְ הָעוֹלָם, שֶׁהֶחֱיָנוּ וְקִיְּמָנוּ וְהִגִּיעָנוּ לַזְּמָן הַזֶּה. Blessed are You, L-rd our G-d, King of the universe, who hath sustained and kept us, and brought us to this time. ואחר כך נוטל ידיו ומברך "על נטילת ידיים"
ָּרוּךְ אַתָּה יְהוָה אֱלֹהֵינוּ מֶלֶךְ הָעוֹלָם, אֲשֶׁר קִדְּשָׁנוּ בְּמִצְווֹתָיו, וְצִוָּנוּ עַל נְטִילַת יָדָיִם. Blessed are You, L-rd our G-d, King of the Universe, Who sanctified us with His commandments, and commanded us on washing hands. בָּרוּךְ אַתָּה יְהוָה אֱלֹהֵינוּ מֶלֶךְ הָעוֹלָם, הַמּוֹצִיא לֶחֶם מִן הָאָרֶץ. The second cup is poured and upon it are read these verses from the Torah of Moses. 1 Now the L-rd said unto Avram: 'Get thee out of your country, and from your kindred, and from your father's house, unto the land that I will show you. ד וַיֵּלֶךְ אַבְרָם, כַּאֲשֶׁר דִּבֶּר אֵלָיו יְהוָה, וַיֵּלֶךְ אִתּוֹ, לוֹט; וְאַבְרָם, בֶּן-חָמֵשׁ שָׁנִים וְשִׁבְעִים שָׁנָה, בְּצֵאתוֹ, מֵחָרָן. 4 So Avram went, as the L-rd had spoken unto him; and Lot went with him; and Avram was seventy and five years old when he departed out of Haran. ה וַיִּקַּח אַבְרָם אֶת-שָׂרַי אִשְׁתּוֹ וְאֶת-לוֹט בֶּן-אָחִיו, וְאֶת-כָּל-רְכוּשָׁם אֲשֶׁר רָכָשׁוּ, וְאֶת-הַנֶּפֶשׁ, אֲשֶׁר-עָשׂוּ בְחָרָן; וַיֵּצְאוּ, לָלֶכֶת אַרְצָה כְּנַעַן, וַיָּבֹאוּ, אַרְצָה כְּנָעַן. 5 And Avram took Sarai his wife, and Lot his brother's son, and all their substance that they had gathered, and the souls that they had gotten in Haran; and they went forth to go into the land of Canaan; and into the land of Canaan they came. Although Avram was already advanced in years when he left Haran, his story was just beginning. When Avram made aliyah at 75, he and Sarai weren’t “ending up” in the land of Canaan. They were starting out....Just like you. Whether young or old, when you leave the land of your birth for the land of promise, your life has truly just begun. The third cup is poured and upon it are read these verses from the Prophets. ד כֹּה אָמַר, יְהוָה צְבָאוֹת, עֹד יֵשְׁבוּ זְקֵנִים וּזְקֵנוֹת, בִּרְחֹבוֹת יְרוּשָׁלִָם; וְאִישׁ מִשְׁעַנְתּוֹ בְּיָדוֹ, מֵרֹב יָמִים. 4 Thus saith the L-rd of hosts: There shall yet be zeqenim and zeqenoth sitting by the streets of Jerusalem, every man with his staff in his hand for great age. ה וּרְחֹבוֹת הָעִיר יִמָּלְאוּ, יְלָדִים וִילָדוֹת, מְשַׂחֲקִים, בִּרְחֹבֹתֶיהָ. 5 And the streets of the city shall be full of boys and girls playing. ו כֹּה אָמַר, יְהוָה צְבָאוֹת, כִּי יִפָּלֵא בְּעֵינֵי שְׁאֵרִית הָעָם הַזֶּה, בַּיָּמִים הָהֵם--גַּם-בְּעֵינַי, יִפָּלֵא, נְאֻם, יְהוָה צְבָאוֹת. 6 Thus saith the L-rd of hosts: As it be wonderful in the eyes of the remnant of this people in those days, it shall also be wonderful in My eyes, saith the L-rd of hosts. ז כֹּה אָמַר יְהוָה צְבָאוֹת, הִנְנִי מוֹשִׁיעַ אֶת-עַמִּי מֵאֶרֶץ מִזְרָח, וּמֵאֶרֶץ, מְבוֹא הַשָּׁמֶשׁ. ח וְהֵבֵאתִי אֹתָם, וְשָׁכְנוּ בְּתוֹךְ יְרוּשָׁלִָם; וְהָיוּ-לִי לְעָם, וַאֲנִי אֶהְיֶה לָהֶם לֵאלֹהִים--בֶּאֱמֶת, וּבִצְדָקָה. 8 And I will bring them, and they shall dwell in the midst of Jerusalem; and they shall be My people, and I will be their G-d, in truth and in righteousness. In moments like these, עלינו להבין את גודל השעה, it is our duty to comprehend the greatness of the hour. At this very second, at this very table we are seeing the fulfillment of the word of Almighty God. For untold generations, the righteous of Israel prayed to merit seeing such miracles in their lifetime. Today we are thankful, not only for our own redemption, but for our fathers and mothers whose tearful prayers pierced the heavens, and moved the Holy One, Blessed be he to raise us out of our graves and bring us into the land of the living. It is indeed “wonderful in our eyes” and in the eyes of the L-rd. The fourth cup is poured and verses from the holy writings, from the prayer of Nememiah Ben-Hakhaliah for the success of the Jews in Eretz Yisrael, are pronounced over it. ח זְכָר-נָא, אֶת-הַדָּבָר, אֲשֶׁר צִוִּיתָ אֶת-מֹשֶׁה עַבְדְּךָ, לֵאמֹר: אַתֶּם תִּמְעָלוּ--אֲנִי, אָפִיץ אֶתְכֶם בָּעַמִּים. ט וְשַׁבְתֶּם אֵלַי--וּשְׁמַרְתֶּם מִצְו‍ֹתַי, וַעֲשִׂיתֶם אֹתָם: אִם-יִהְיֶה נִדַּחֲכֶם בִּקְצֵה הַשָּׁמַיִם, מִשָּׁם אֲקַבְּצֵם, והבואתים (וַהֲבִיאֹתִים) אֶל-הַמָּקוֹם, אֲשֶׁר בָּחַרְתִּי לְשַׁכֵּן אֶת-שְׁמִי שָׁם. 9 but if you return unto Me, and keep My commandments and do them, though your dispersed were in the uttermost part of the heavens, yet will I gather them from there, and will bring them to the place that I have chosen to cause My name to dwell there. י וְהֵם עֲבָדֶיךָ, וְעַמֶּךָ--אֲשֶׁר פָּדִיתָ בְּכֹחֲךָ הַגָּדוֹל, וּבְיָדְךָ הַחֲזָקָה. There is no aliyah without hardship, but nothing worth having comes easy. We may not be living in the palace at Shushan anymore, but we breath the air of freedom and redemption. This year we are in the land of Israel, this year we are free. Today it is so with us, and soon it will be so with the whole house of Israel, and say amen! At this point the Grace after meals is said and the seder is ended with the first stanza of “Adir Hu”, to remind us that geulah is a process, and that our redemption is not yet complete. NOTE: For a pdf version of the Hagaddah, updated to include a fifth cup, write to rivkah30 at gmail dot com.